By Chris Williams: WBC welterweight champion ‘Showtime’ Shawn Porter says he doesn’t rate Adrien ‘The Problem’ Broner as a puncher at 147, and he sees him losing this Saturday night when he challenges WBA ‘regular’ welterweight champion Manny Pacquiao (60-7-2, 39 KOs) when the two of them battle it out on SHOWTIME PPV at the MGM Grand in Las Vegas, Nevada. It’s easy for Porter to say that Broner lacks punching power at welterweight, since he’s NEVER knocked anyone out in his five fights at welterweight during his 11-year pro career. “I don’t believe in his punching power, but I definitely believe in his speed,” Porter said to Fighthype about Broner’s lack of power at 147. “We have to look at his [Broner] track record for the last three fights. Is he using his speed? If he uses his speed, he makes it an interesting fight. I don’t think it’s a fight that he wins, but he does make it interesting,” Porter said. Some boxing fans might point out that Broner knocked Porter down in the 12th round in their fight in June 2015. However, Porter wasn’t hurt by the knockdown. It was a flash knockdown in which Porter got hit by a shot that he didn’t see, and he went down. Those kinds of shots don’t require a lot of power. Broner’s punches had no effect in the first 11 rounds, and he was getting dominated until the 12th. Even in that round, the only thing Broner did was drop Porter with a left hand shot he didn’t see coming. Broner’s record since moving up to welterweight in 2013 is 2-2-1. That record is slightly misleading though, as two of Broner’s wins over Paulie Malignaggi and Adrian Granados were controversial with him decisions in fights that a lot of boxing fans saw him losing. If Broner’s fights against Malignaggi and Granados were scored the way many in the boxing public saw them, his record would be 0-4-1. However. a lot of fans also think Broner deserved a loss in his recent 12 round draw against Jessie Vargas last April. With that fight scored a loss as well, Broner’s record since moving up to welterweight could very well be 0-5. What this means is Broner clearly isn’t a welterweight, and he should have stayed at super featherweight rather than moving to lightweight, light welterweight and finally welterweight. 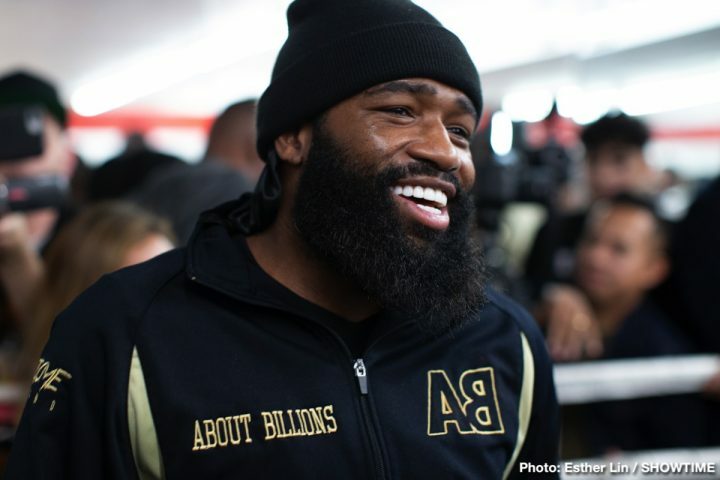 “He’s got to be able to counter Manny,” Porter said about Broner. “He doesn’t have to walk Manny down. If you walk Manny down, you’re walking into everything,” Porter said. Broner should try and box Manny the way Floyd Mayweather Jr. did in beating him in 2015. Broner doesn’t have the power or the hand speed to walk Pacquiao down to beat him. If Broner tries to exchange with Pacquiao, he’s going to get hurt, and possibly knocked out for the first time in his career. Counter punching is fine, but Broner isn’t the best counter puncher. Without the power to keep Pacquiao off of him, Broner is going to be in serious trouble on Saturday night. This is going to be a bad fight for Broner if he can’t keep Pacquiao from unloading on him.